Welcome to The Modern Borefare Interview, an occasional series of discussions with up-and-coming creators, writers, builders and DIY’ers of the comics/video game/pop culture scene. 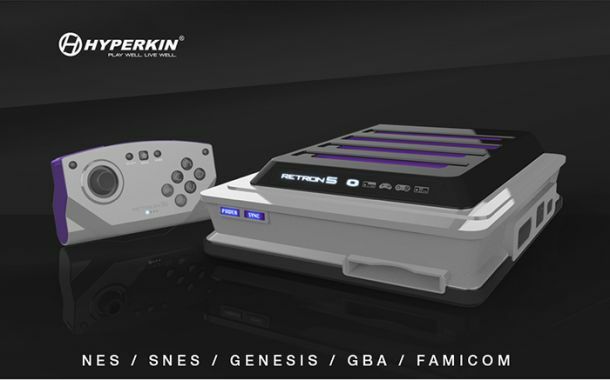 Today we’re talking with David Yu, Marketing Director and resident Man of Many Hats at Hyperkin Games, the makers of the upcoming Retron 5 all-in-one retro gaming console. Modern Borefare: So, what were Hyperkin’s’s goals in developing its Retron line? What’s the overarching mission statement? David Yu: In a nutshell, we really like to make cool stuff. We pretty much make stuff that we want to play with. [Hyperkin] started off making DDR dance pads. After a while the company became very successful and it got to a point where a lot of retailers and our partners were asking us if we could make other accessories and other types of products. After doing some research we found that the retro gaming niche, that market was grossly underserved. So we realized we wanted to make retro gaming our focus. When it comes to the Retron 5, previously we made a lot of different consoles that were maybe up to the level of the original but never surpassed it or offered anything new. In the back of our minds we always felt like we wanted to make a console that would not only cater to the retro gaming market but would be able to actually give all the features that people wished they had when they played their retro games. The development of Retron 5 was almost two years in the making and during that time there were a lot of things we tested out, we tried out. Ultimately, for all of us here, we grew up with most of these systems. We love these systems dearly and we wanted to be able to create a console on which every gamer out there has the ability to play some of the most beloved games in the world. MB: You mentioned the two-year development cycle for the Retron 5. I know it started out as the Retron 4, the successor to the Retron 3. What additions give this Retron its “fiveness”, as opposed to just “fourness”? DY: Unlike other consoles we’ve previously made, we created everything from the ground up: the board, the chipsets, the programming, everything is catered toward the games we’re supporting for this new system. There have been issues with games with lockout chips, or FX chips, or SA1 chips. A lot of the original hardware we used to make the previous consoles was making it difficult for us to actually find those parts and even if we did we had to buy a large bulk of them. Ultimately we decided to build something from the ground up that would be able to fix a lot of the issues and ensure that a lot of the compatibility and the other stuff that previously might have been an issue on previous consoles wouldn’t happen on this console. We always wanted to create a console that either rivaled or was something that exceeded or was better than the original console. When you take a look at the market, there hasn’t really been any retro consoles released that have been like that. We know a lot of purists and retro gamers out there really like to just play on their original consoles. We wanted to give them a reason to stash those old consoles away, put them back in storage, and use our console not only to conserve space, not only to make the wiring less complicated, but [because it’s] something you’d be able to use on the latest gen stuff, like HDTVs. MB: From screen grabs we’ve seen online it appears there’s some degree of smoothing or upscaling going on. DY: Yeah, definitely. The upconversion was a big deal for us when we did the HDMI because on the [HD]TVs those pixels and colors bleed into each other. And that was one of our biggest gripes and pet peeves so we added several filters in there to ensure that when people play their games on the Retron 5, on an HDTV, that you’d be able to identify every little pixel, that every visual is crisp, every visual is clean. MB: Is the general idea that a 4:3 image would be stretched to 16:9? DY: Yes, the 4:3 image will have the ability to be stretched to 16:9 but even when it does get stretched we wanted to ensure that there wasn’t any bleeding or having the pixilation look really bad. Our goal was to try to fill up the screen as much as possible and a lot of these different games have different resolutions. For example, the GBA has this weird, crazy aspect ratio – I think like 8:5 or something like that. A lot of these games didn’t have the same types of resolutions so that was a challenge in itself. MB: I’m assuming the option still exists to view the games in their native aspect ratios? MB: You mentioned GBA games, but for original Game Boy games, do you have the option to colorize the way the SNES did with the Super Game Boy? DY: To my knowledge, yes, it should be able to do all those kind of things. I think we should have an option to. I need to check with my developer again but to my knowledge you should be able to switch to color or looking at it in standard balck and white. MB: Would that be actual black and white, or more like the classic Game Boy black and green? DY: It’ll be closer to that black and green kind of look. MB: We know the Retron 5 accepts Genesis carts but not Master System, so owners will have to supply their own Power Base Converter if they want to play Master System games on the Retron 5. Are there any other original peripherals that you’ll be able to use? DY: Normally our policy is that we don’t talk about competitors’ or third party products. What we want to concentrate on first is at least trying to get all the compatibility and all the features we’re trying to get at launch. We want to concentrate on that first and then we have this long laundry list of things that we want to try to do for future updates and that is definitely something that we are looking to in the future. But for the Game Genie and things like that, for the most part we have a built-in cheat device inside of the Retron 5 so it will act as a Game Genie. The only thing is you won’t be able to use the hex editor to make your own codes. That being said, a lot of the cheats that are on the Retron 5 are from our team that also makes the Game Genie. That team has been doing cheats for several years now, spanning all the way back to Game Shark and Action Replay. A lot of the cheats they implemented on the Retron 5 were proprietary cheats they’ve held on to for almost 20, 30 years now. MB: What about peripherals like the Power Pad, Power Glove, and 4 Way Play. Any idea if those will work? DY: I will say this: we have done a lot of peripheral testing. There are only certain peripherals that will not work – that’s not due to the console’s limitations, it’s the televisions’ limitations – like Super Scopes, those kind of things. I think the R.O.B. – I have to confirm with someone – the R.O.B. might be something that might not be compatible. But things like the [Mario] Paint mouse, or the Power Pad, even the Power Glove, they should be able to work. I know the Sega multi-tap from EA, we did do the compatibility testing on that. Something like that will work, the only thing is the [EA 4 Way Play] is situated such that the two plugs are next to each other, whereas on our console the player one and player two plugs are spread apart. That might be an issue when it comes to getting some of those peripherals to work. But the way the Retron 5 is, anyone can use any controller playing any system. So in essence you can have, say, two Bluetooth wireless controllers, two Sega Genesis controllers, and maybe a Super Nintendo controller and you can play a five-player game on there without a multi-tap. MB: A moment ago you mentioned “future updates”. Do you mean an updated product, or is that some kind of patch or firmware update? DY: I’m glad you mentioned that. 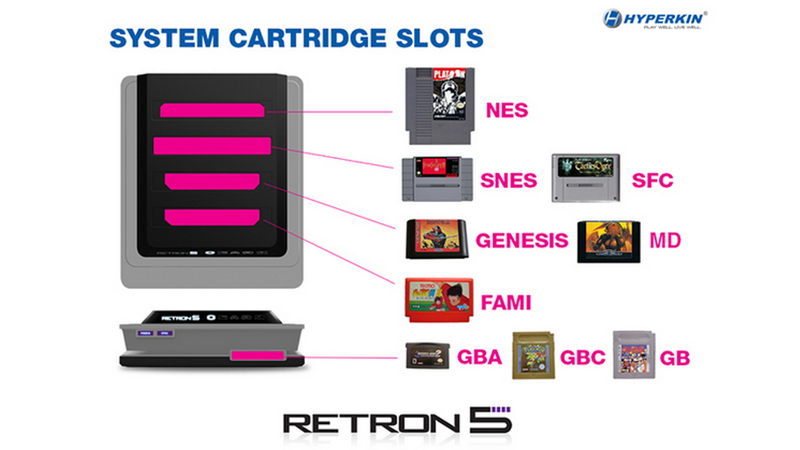 Pretty soon we’ll have a Retron 5 website up, which is dedicated strictly to the Retron 5. On that website you’ll have all the latest information and that’ll be the main conduit in which you can download the firmware updates. The way it’ll work is: we will post the update and let everyone know through Facebook, Twitter and various other media that an update is available. The user will go onto the site, download the update, and just transfer that update to a flash drive or a thumb drive. Then via the USB port of the Retron 5 you would just plug in that thumb drive. There’s a section of the GUI that will allow you to do the update and it’ll update it from there. We have been saying that we’re aiming for 100% compatibility. We do know that there is a possibility that we might skip or miss some of the games initially when we do the compatibility testing. That website will be a great place for people to say, hey, this game doesn’t work. We’ll send the requests to our development team and they will track down the game and ensure that there are no longer any compatibility issues. Once they fix that issue they’ll probably post an update letting people know. In the update, we’ll put up some kind of changelog or something to notify the users as to what this update is updating on the firmware. MB: You talked about Facebook and Twitter. There’s been some negative stuff on social media about pushed back release dates. Any comment? DY: When we initially set the preorder date for the Retron 5 it wasn’t supposed to go live. It was basically supposed to be a placeholder just to let people know that when a preorder date becomes available, people would be able to preorder it. To my knowledge on the Amazon website there’s a button on some other preorder products that allow [Amazon] to notify you when the preorder is live. Initially when we set that up that was the whole purpose. Initially we told them the October 31st placeholder date but it was just to be put on there so people are aware that [Amazon] would be a place where people could preorder it. Around the time that release date was supposed to come out was supposed to be the time we made the final announcement [about the release]. All the dates were supposed to match up but somehow – and I don’t know how it happened, I guess it was some kind of internal error where we might have clicked something wrong or they might have clicked something wrong – but they put it live before we were actually ready for it. Once that went up, we were doing some damage control trying to contact Amazon, let them know that’s not the date, you guys shouldn’t have put that up. At that point we’re like, you know, we might as well just make the announcement now. MB: Retron 5 has the ability to take screenshots. Will it also be able to do video capture? DY: I don’t think we’re going to have that for launch but it definitely is something that we’re looking into and it might be something that we might want to proceed [on] in a future update. MB: I don’t believe there’s an Ethernet port on the console. Are there plans to take the Retron 5 online at all? DY: That was initially discussed as something we might want to do for the initial console design. However, after doing some research on it, it’s extremely difficult. And not only that, you would actually have to set up a server, set up a service, and do all kinds of different programming for different kinds of game. Perhaps that might be something we might look [at] later on down the line on future consoles. But more than likely, for this console that’s something that’s not going to happen. MB: So I take it that means there’s no chance I can use this bad boy to get on the Sega Channel? DY: (Laughs.) More than likely not. That is interesting, though. I didn’t think of that. Maybe we might look into that. DY: At this time, no. DY: That is a pretty strong possibility but no plans have been started. MB: And now, my most important question: is there any way I can get Virtual Boy game support on the Retron 5? DY: (Laughs.) That’s an iffy subject but I think more than likely no at this time, definitely not at launch. To be honest with you, there aren’t enough Virtual Boy systems to warrant the manpower to look into doing Virtual Boy compatibility with the Retron 5. But a lot of this stuff, we don’t necessarily say no because a lot of the time we just keep it in the “think bank”, keep it in the hard drive for a while. We always revisit our old ideas and a lot of this stuff could potentially happen in future consoles. The Retron 5 launches December 10. Modern Borefare will have a full report as soon as we get our grubby little hands on it. I want to know what they mean by near-100% compatibility. Does it just mean that nearly 100% of games will run (as they already will on PC-based emulators), or does it mean that they will run accurately? Hyperkin has denied that this uses software emulation, but certain things I’ve read make me suspect Hyperkin’s marketing people don’t understand what software emulation is. If X dies during the attract mode of Mega Man X or shadows are screwed up in Air Strike Patrol, it’s a pass from me, as I can already get emulators that are mostly–but not completely–accurate on my laptop. Emulators are perfectly legal and are currently being sold on google play or similar apps market without any legal issues. What is illegal is uploading or downloading a ROM file and in most countries, running a copy that does not come from a game physically own. I am sure the reason the company behind RetroN 5 is strongly denying they are using emulators is because this could harm their sell as many people think emulation is bad or not like the real thing. But I really do not see how you could have features like savestates, video filters and upgradeable compatibility fixes without relying on emulation. This is very likely some integrated hardware (CPU+GPU+audio) running an emulator framework that read the ROM file directly from the cartridge, these things already exist (although in a much less convenient way !). You’re absolutely right – software emulators are indeed legal, even in the US. If used in something like the R5, where users have to physically insert a copy of the cartridge containing the ROM file, the emulation software would not be facilitating copyright infringement. On the other hand, I’m fairly certain emulators like the ones Joshua is referring to are illegal, because you download the ROM file from the internet.